It all started with us sitting on the couch, organizing loose plans for the week like the sorta type A but not exactly type A people most (meaning, not me usually) of us are. And I forget who was the first to mention it, but somehow NOLA ended up on the table, and Google Maps revealed that it was only a short 3 hour drive away. A few phone calls later (to the friends flying in the morning we hoped to go), and with a few adjustments in the pick up plans, we were set to explore The Big Easy. It was a perfect kind of trip where the weather was 80 and sunny and I wore an outfit that was easy and breezy and didn't make me sweat ungodly amounts, so extra perfect if you ask me. Our first stop was an $11 bathroom trip which was a little less than ideal, but once our bladders were empty we walked our way through Bourbon and other accompanying streets all the way to Cafe Du Monde. I had never been and it is so freaking cute and the beignets were hot and fresh and omg the powdered sugar! Everywhere. So of course I took photos of nearly everyone eating a beignet. And insisted on a group photo at Jackson Square, where a kind stranger once again surprised me with their decent photography skills. The rest of the trip was a flurry of hurricanes and horny gators, shrimp po' boys, oysters in more ways than one, mardi gras beads, and voodoo dolls. 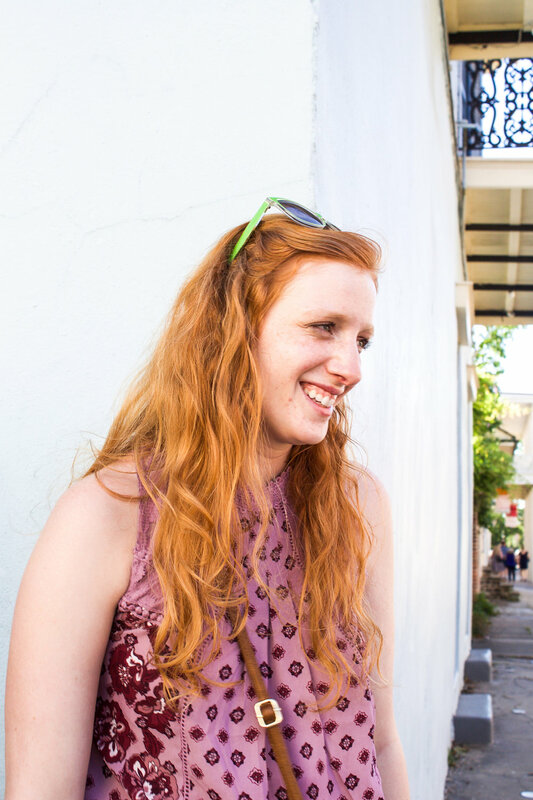 We fit in as much as we could in this magical city, including a visit to a hot sauce tasting and walking through Frenchmen Street for some live jazz. And a second trip in the evening to Cafe Du Monde because beignets are worth second trips. Hands down one of the best decisions we made that week, and NOLA is certainly on my list to re-visit - the food, culture, and architecture of the French Quarter was captivating and magical. Hope you enjoy the photos from the day! My last car crew! Andrew, Revathi, and Zach. The best car combo there ever was. Out of the 13 people on the trip, I managed to capture 8 of them eating beignets. Below are Ben, Audrey, Sonia, Andrew, Aava, and me - and if you keep scrolling down you'll see Elizabeth and Aida from our second excursion there. They all could be food commercial models, I tell you! Chargrilled oysters and shrimp/oyster po' boys at Felix's, which was right across from the better known Acme but not nearly as busy, and the food was still amazing! Three of the cutest spicy brown ladies in all the land - Sonia, Revathi, and Aava! Oh how I love this group. This was at Pat O'Briens, where most of us indulged in hurricanes and juleps and basked in the sun. Isn't my friend Aida the cutest? This was near the end of the night, right before finding one last po' boy shop before the car trip back to Alabama. I've got one more batch of photos for you guys from vacation - coming soon! For now, have a happy Sunday, and a wonderful week!